Internal Fuel Fill to fit Superjet and Blaster. Our billet fuel pickups feature super low profile design with open ports to allow for easy fueling. Features include: Dual pickups, feed twin carbs, run a reserve, or feed a primer, your choice. 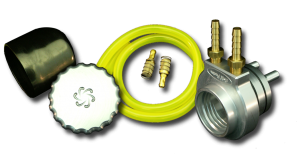 Tank filters, Billet o-ringed cap, Simple slip fit design, no cutting or drilling required. Extremely low profile, sits lower than the OEM unit. Unobstructed fill, nothing in the way blocking your filler hose.